In the early the days of my photography I had a long list of places that I wanted to visit with the hopes of creating a famous iconic image. As I studied and read the books of my favourite photographers like Galen Rowell, Frans Lanting and Freeman Patterson I marvelled at the photographs they took in places like Nepal, the Amazon and all over Africa. As the novelty of my home town started to wear off I found myself making a list of places where I wanted to go to create a “one of a kind” masterpiece. I envisioned photos of the Rain Forest, Icebergs, or maybe the Spirit Bear of the Pacific Coast. These places are still on my to-do list, but in recent years I’ve come to realize that there is still so much more to see in my own backyard. Last Saturday I went out for an early morning trek but I just couldn’t seem to find a subject that inspired me. I was looking for something extraordinary, but the weather wasn’t cooperating and I just couldn’t get focused on exactly what it was I was looking for. Eventually, I decided to drive to a local park called Rockwood Park in the city. I stopped at a lake and spent close to an hour watching and taking photographs of the ducks that live around the pond and the park. The lake that they usually swim in was mostly frozen except for one tiny area. I opened up the hatch of my car and stood under it to protect me from the rain and with my camera on my tripod I took somewhere in the range of a 100 shots of the mallards as they huddled together on the ice and occasionally visited the open water in the lake. 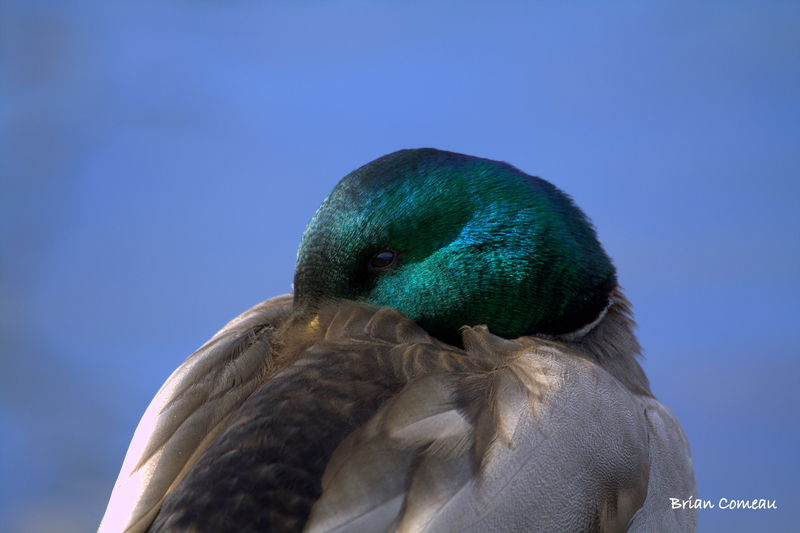 I’ve likely taken several hundred photographs of ducks over the past 20 years since I bought my first camera. If I were to count my slides and the images on my computer I’m pretty confident that the mallard would be the most popular subject in my portfolio of wildlife. 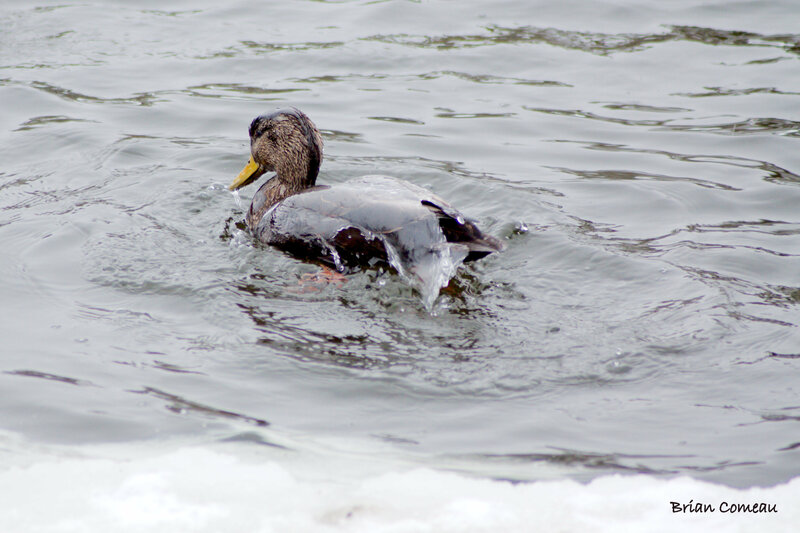 A couple of years ago I took a photograph of two ducks in the Kennebecasis River swimming and bobbing up and down while looking for food. 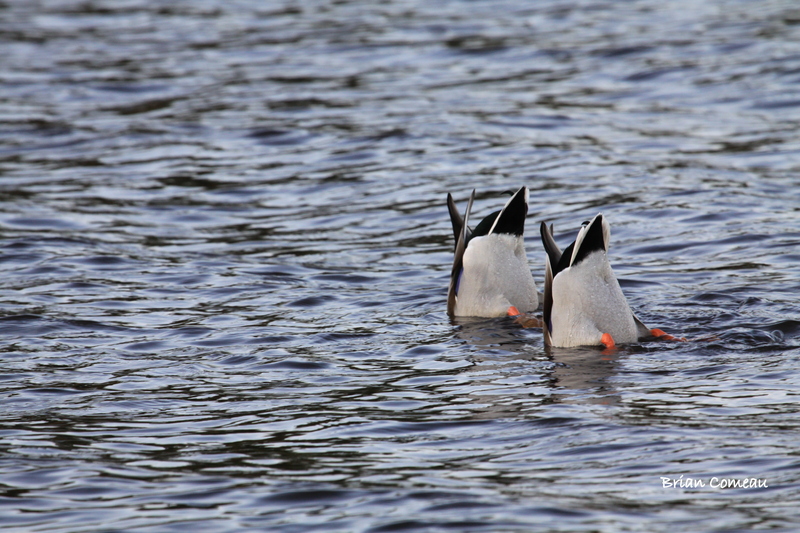 I was fortunate to get a shot while these two birds put their tails in the air and heads in the water. If the Olympic synchronized swimming judges were watching they would have given them a perfect 10. It’s become one of my favourite images of all time. While I took the photographs of the ducks on the lake a few days ago I quickly realized that the common things we see everyday can offer many opportunities for uncommon images. Parents, if you have taken you children to the beach, you have no doubt come home with a pocket (or pockets) full of rocks. It doesn’t seem to matter how many times I take my kids down to walk on the beach along the ocean we still come home every time with a pocket full of rocks. Every visit gives them the chance to get down and dirty on hands and knees to study the rocks and sometimes creatures on the ocean floor and beach. To them each visit is unique and provides a new opportunity to find that unique (or uncommon) “treasure”. With each of the new rocks I’m handed I’ll admit, my first thought is “it’s just like all the others.” It’s round AND HEAVY; but not to them, each one is special because they took the time to find it. So just because I visit the same place over again it doesn’t mean that there isn’t some unique to see on each trip. When I look at the collection of rocks on my deck I’m reminded that I need to pay more attention to the details and look a little closer at things like my children do. Perhaps I’ll bring home more treasures like the ones they find. Really nice pictures! What type of camera and lens did you use? These were all taken with a Canon 50D. The first and third images I used the 100-400 Canon and the middle was actually taken with an old Canon 70-210. Thanks for the comments and for visiting my blog. I really appreciate it. I am like you a bit. I too long to see the world renowned sites around the world, but I find myself getting bored every now and then living at one. I try to refocus and appreciate that which is ordinary and just see it in an extraordinary way. A perfect example is your duck pair. That is such a great capture. When I need inspiration, I will do a photographic study, picking out one thing and finding it everywhere. Your rocks are an example. I love shooting just rocks or even ice.There is so much pattern in both and one can make endless compositions. Finding adds the passion back… just like your kids are telling you. I agree, take a hint from them. Kid’s play is important in creativity. Thanks Donna. That duck shot makes me laugh. It’s just like they were posing. You are right about looking for patterns in simple things. Sometimes we (I) make shooting more difficult than it needs to be. The top photo slays me, pal. The framing and the space above the head are *perfect*. It’s so true Brian, we have plenty to look at and discover around our immediate environment. Thanks for reminding us about that. I don’t travel much to other countries, so my photography is mostly in my town and villages nearby. Your photos are so beautiful, the first one is really beautiful and I love the shot of the ducks with their heads under water, it’s such a unique photo ! Thanks for the comments Jocelyne. I don’t travel much either, so I shoot a lot in my area which is where all of these were taken. The two ducks upside down is a favourite. It was really a bit of chance and luck but I’ll take it sometimes. Thanks again for visiting. That last one is adorable! Thank you for the very kind comment Michelle. Terrific story about the mallards (except for the snapping turtles). 🙂 Keep taking care of them… I think they are cool too. If you want to learn more about gardening keep following and reading Donna. She is incredible and so knowledgeable.